Honestly, almost no one I know loved 2016. From deaths of famous and beloved people, to an election that deepened the already existing wedge between people in America, to scenes of suffering around the world, many of us will be glad to leave this year behind in hopes that next year will be better. 1. Last year around this time, I blogged about my hopes for 2016. The most important one came true: a family member with a years-long illness is doing much, much better. This alone was enough to save the year for me. 2. In March, I signed with a literary agent! 3. We adopted this adorable little guy from a shelter! Thanks to him, I get exercise in all kinds of weather. Plus he's a very talented cuddler. 4. I pulled myself out of a writing slump, and my current work in progress will be ready to send to critique partners within days. 5. In the spring, the family and I had a quick trip to the Bonn/Cologne area. She here, here and here for some fun pictures! A few months later, we enjoyed our summer vacation in the beautiful Bavarian Forest. How about you? What wonderfulness came out of 2016 for you personally? Bonus picture: surprising view on my walk with the dog when I took a path I'd never been on last week. 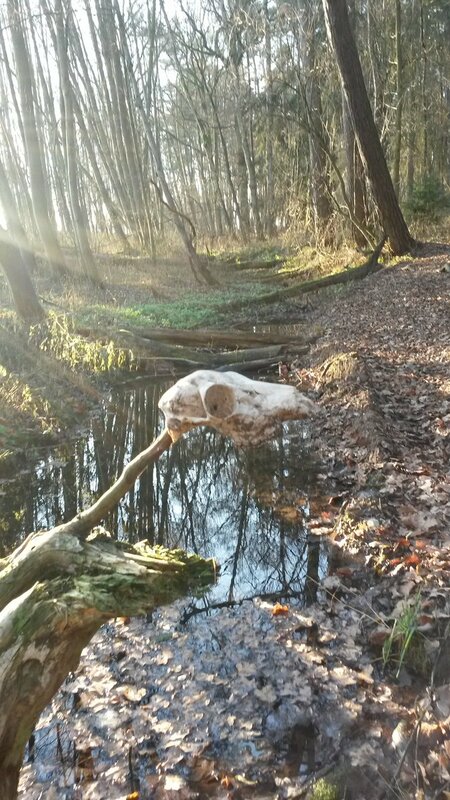 Yes, that's a skull .